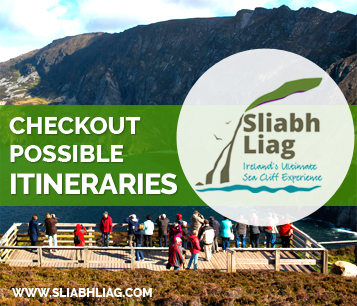 An alternative way of viewing the breath taking landscape of the Sliabh Liag Cliffs is by boat. 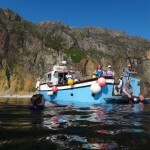 Nuala Star Teelin offers amazing boat trips along the famous cliffs. The boat goes close to the shore so that visitors can appreciate the spectacular sights. Nuala also stops the boat so that visitors can take a dip in the Atlantic Ocean. They have also been joined on occasion by dolphins, whales and seals. There is also a range of bird life in the area that can be appreciated from the boat. 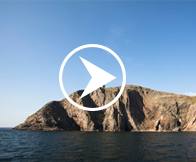 Try something different on your trip along the Wild Atlantic Way and join Nuala and her crew on the waters surrounding the Sliabh Liag Cliffs. Donegalbaycharters.com can cater for all occasions and offer a wide variety of angling and sightseeing trips around Donegal Bay. Enjoy a 2Hr mackerel angling trip or a 1/2 day or full day fishing trips in the glorious Donegal Bay on the Wild Atlantic Way. Rods and reels are included in the price. A full selection of tackle is always available. Interested in Angling? Then fishing on the Glenn River System could be for you. Paddle your way around the rugged coastline of South West Dongeal. Rapid Kayaking offer sea kayaking tours of isolated beaches, eerie caves and rocky islands along the Wild Atlantic Way. Visitors can choose from a 2 hour or 4 hour trip which leaves from Boatstrand, Carrickfinn, Kincasslagh Harbour, Cruit Island and Portnoo during the summer months. They also offer half day sit-on kayak island tours which explore the Gaeltacht Islands, sea caves and spectacular scenic landscape. Discover the Wild Atlantic Way in a unique way with Rapid Kayaking.